The Batman Is Connected to Joaquin Phoenix's Joker Movie? The production for the Joker Origin Movie will reportedly start this fall and it has already been revealed that the film will take place outside of the DCEU. Instead, it's been rumored that the origin movie will be under a new DC Films banner of either DC Black or DC Dark and now, another rumor states that Matt Reeves' The Batman will be under that new banner as well. There's a lot to think about if this rumor ends up being true, but it does seem to make a lot of sense for the future of Warner Bros. and DC Films. 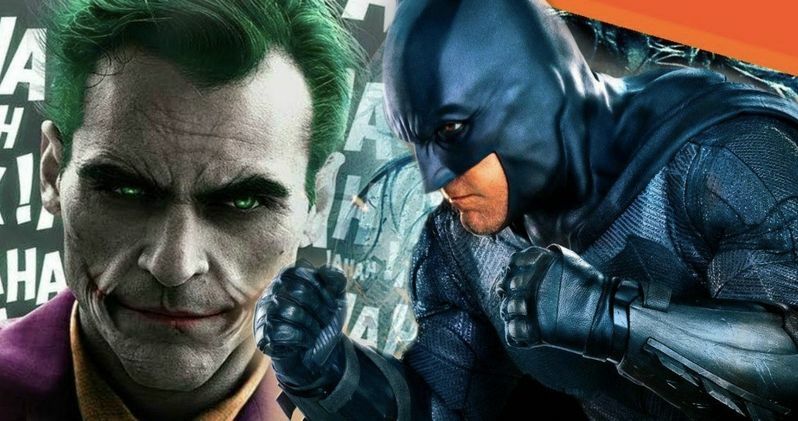 The new rumor suggesting that The Batman and Joker origin movies will be connected comes to us from Forbes writer Mark Hughes, who recently appeared on the Superhero News Show. Hughes says that he has talked to people who are close to the projects and thinks that we're going to see some interconnectedness after all. And while news about The Batman is scarce, this rumor makes a lot of sense. Hughes had this to say. "I think Joaquin Phoenix is playing the Joker in a standalone film, that will possibly wind up not being standalone as the situation evolved with the solo Batman movies and the future of the DCEU shapes up. I haven't heard anything firm, but I've heard certainly whispers from several people that I've talked to about that project. And what it sounds like is that if that project takes shape, if Martin Scorsese is going to be on board producing a film with Joaquin Phoenix playing the Joker... so now it looks like there's going to be that project and I have heard from a few people that there is talk of if The Joker movie is really going to go forward and if it's really that good, if we're rebooting Batman anyway, he's going to need a Joker. We can't use preexisting Jokers. So we either have Jared Leto showing up as the Joker in some sort of sequel movie, and a Joaquin Phoenix solo Joker movie, and then we have to have another Joker. Wouldn't it make more sense to take a Martin Scorsese produced Joker with Joaquin Phoenix and wait and see if it works out, then just cross that and have that be the Joker for the new Batman?" Joaquin Phoenix is reportedly on board to portray the Clown Prince of Crime in the new origin movie, which is expected to go into production this fall under the working title of Romeo. As for Matt Reeves' The Batman, a script is reportedly finished, but other than that, it's anybody's guess as to what happens moving forward. However, having Phoneix's Joker stick around for more movies with a new version of Batman seems logical, especially considering that Jared Leto also has a new Joker project coming soon as well, which is going to further confuse what version of the iconic villain belongs where. Matt Reeves spoke about The Batman not being a part of an extended universe last year, which took fans by surprise. He later clarified his statement and said that the film will indeed be a part of the DCEU. A lot has changed since that clarification last year and it appears that the director is on the hunt for a new actor to portray a younger version of the Dark Knight. If that's true, it would make complete sense to do a complete reboot of the character and put the project under one of the new banners that Warner Bros. and DC Films are working on. Nothing has been officially confirmed about the Joker origin movie and The Batman being connected, but hopefully we receive some information in a few weeks at San Diego Comic-Con. Warner Bros. and DC Films will practically have Hall H to themselves since Marvel Studios is sitting this year out, which means it's the perfect time to makes some big announcements. For now, we'll just have to wait and see what happens with the two projects. You can check out the rest of what Mark Hughes had to say about The Batman and Joker origin movies over at Superhero News Show.